"You'll be amazed by what it is able to do, but don't analyze. Enjoy." The effectiveness of isolation and damping products has both fascinated me and led me to write about, and subsequently use, products from companies like Bright Star Audio, Harmonic Resolution Systems and Silent Running Audio. That such products work is beyond debate as far as I'm concerned; I've heard the improvement they can effect. How they work, though, is a subject often clouded in mystery. To some designers of isolation and damping products, better sound boils down to extinguishing as much resonance and microvibration as possible, or lowering the equipment's own resonance frequency below audibility. Others, however, believe that all materials have their own intrinsic influence on sound, and optimizing them leads to better overall performance. The first school of thought is valid if you believe that resonance and vibration are universally bad; the second makes sense if you believe that the attempt at killing what is perceived to be bad for the music also kills the music. In light of these theories, testing by ear seems like a quaint though perfectly valid way to determine effectiveness. I suspect Kevin Tellekamp of Silent Running Audio would agree with me. The sonic contributions of his Ohio Class XL Plus2 platforms take no effort to hear. The bigger, ballsier presentation, especially in the bass, is something that might pass a blind listening test, and the improved dynamic contrasts will have you thinking that your amp has more power and a lower noise floor. The VR 3.0 isoBases I reviewed three years ago were worthy additions to my audio system, increasing ease and focus. The Ohio Class XL Plus2 platforms are a different sonic breed and a far more realized version of those earlier products. "Above and around each spike is a hybrid blocked (meaning that its reaction has been chemically stopped) thermal reactive copolymer: a substance that can change its darometer (hardness and softness) in a pre-calculated fashion, and very quickly. The spikes are rather like shock absorbers whose range of motion is governed by the copolymer...."
As you move beyond the VR series, the platforms start to take additional parameters into account. Kevin Tellekamp, the genial head of SRA, he has done work for the US Navy and Air Force, NASA, and other entities. He is professionally versed in acoustics, sound abatement, chemistry, and electronics. I once joked with Kevin about taking up a hobby. "This is my hobby," he said with a laugh. In addition to size, weight and the like, the top-of-the-line Ohio Class XL Plus2 platforms take into account the component's theoretical center of gravity and also incorporate better materials. However, it is the XL Plus2's Raft Isolation System that makes it stand apart from its mates. According to Kevin Tellekamp, the Raft is rather like a car's frame, the element to which all suspension components are anchored. 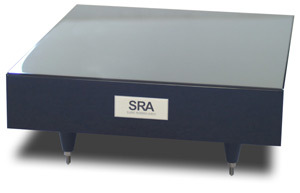 More specifically, SRA's Raft comprises a series of replaceable, upgradeable vertical and horizontal isolation modules that achieve true 6-DOF (degrees of freedom) performance. The outer body of the XL Plus2, on which the component rests, is made of a new high-pressure nano-particle composite material whose main sonic benefit is the ability to allow equipment-born resonance and vibration a path to drain quickly. The 6-DOF isolation lowers the resonance frequency to below 1Hz. Ohio Class XL Plus2 prices range from $1000 to $3000 depending on size and corresponding complexity. The bases I received for Lamm ML2.1 and M1.2 Reference monoblocks cost $1712.50 and $1962.50 each respectively. Ohio Class XL Plus2 also affords something earlier SRA platforms did not: flexibility. Each 2 (squared) platform can be modified for use with equipment other than that for which it was initially made. This is accomplished through the use of a new, upgradeable Raft Isolation System and TRIM packages. This represents an important step forward for Silent Running products, which no longer have to be sold off with the components for which they were created. They can now be "recycled," a feature that will be implemented for the company's VR-series products and above. The only limitation is the physical size of the platform -- you can't buy an Ohio Class XL Plus2 for a small DAC and upgrade it for use with a large power amp. In such cases, SRA will offer a generous trade-in allowance toward the purchase of new platforms. The Ohio Class XL Plus2 is a well-made thing. When you remove it from its wooden shipping crate and peer into its finish, you know some serious handwork was involved in its creation. The craftsmen at Mercedes would admire the rich, lustrous paint'n'polish job. Each XL Plus2 has a unique feel in your hands -- heavy, but not incredibly so, and inert. If you didn't know what a Ohio Class XL Plus2 platform was, you would think it's for isolating something. The HY-80 high-tensile-steel spikes and that feel are dead giveaways. Silent Running first sent me a pair of Ohio Class XL Plus2 platforms for my Lamm ML2.1 amps, with which I had been using VR 3.0 isoBases for three years. Before making the switch and doing some listening, I didn't think about what to expect. In such new-for-old swaps, some modest improvement here and there was SOP. Instantly, from the first few notes on, the difference was profound and completely for the better. So I listened for a few weeks, noting what I heard with each recording, and then went back to the VR-series platforms. With John Hammond's Wicked Grin [Virgin 50764], a collection of great blues-influenced Tom Waits covers, the soundstage was clearly wider -- bigger -- with the Ohio Class XL Plus2 platforms. Also, the bass was better defined and weightier, more controlled as well. Wicked Grin was a good test, with its billowy soundstage and ample bottom end, but what I noted while listening to it was apparent with every recording I played. Again, "completely for the better." A few months after the new platforms for the Lamm ML2.1s arrived, a pair for the Lamm M1.2 Reference amps I have here showed up. I unpacked them with no little enthusiasm: The M1.2s were sitting on Corian slabs that rested directly on my carpeted floor. This was out of necessity -- you don't want to put hot-running amps directly on carpet -- not any sort of supposed sonic betterment. I was especially interested in this changeover. Perhaps the ML2.1s, with their six tubes, were especially suited for the Ohio Class XL Plus2 platforms. Perhaps the benefit for their mostly solid-state brethren would be less evident. As Emeril would say, "Bam!" There they were -- the improved dynamic contrasts and soundstaging, the greater bass weight and control, the guts. Now, these things all apply to the Lamm M1.2 Reference amps when they're resting on Corian, but used with the Ohio Class XL Plus2 bases, the amps shift toward even greater spaciousness and authority. While the benefits were equally apparent for both amplifiers, they were especially welcome with the lower-power single-ended-triode ML2.1s. The Ohio Class XL Plus2 platforms should be considered standard equipment for these amps. I began this review talking about being fascinated with damping and isolation products. The Silent Running Ohio Class XL Plus2 platforms add respect to the fascination. Among all such products I've used, their effect is the most discernible. Hearing it requires no close listening, only the effort to put on more music. To be fair to the other products I use now, none would work with my mono amps. I don't have two that match. However, even when used with digital gear, which is where these products are now, the improvement is not nearly as obvious as Ohio Class XL Plus2's. In eight years, we have named no equipment platforms or bases, no supports of any kind, Reviewers' Choice, but with the Ohio Class XL Plus2 platform there is no way around it. You'll be amazed by what it is able do, but don't analyze. Enjoy. Prices: $1000-$3000 USD depending on size and complexity. We are most grateful to SoundStage! for Marc Mickelsons thoughtful review. Everyone at SRA is excited and honored to have been recognized as a Reviewers' Choice. The new 2 (squared) option now being offered on all of our custom-designed isoBASETM units follows a design concept developed and perfected during SRAs 16-year run to the forefront of high-end audio. Our background includes the work weve done on Virginia-Class nuclear submarines and NASAs zero-gravity isolation projects. Component Specific DesignTM (i.e., knowing what youre designing and building for before starting) truly is the only way to optimize isolation properties, regardless of the object or substrate involved. Component Specific Design and upgrade capability now coexist in one product. 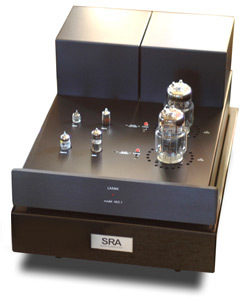 Silent Running Audio has developed a process that imparts to most new SRA isoBASE products a significantly superior performance parameter. We call our latest innovation TRIM, our upgradeable Thermal Reactive Isolation ModuleTM. In addition to superior isolation performance, this new design permits us to remove, recalibrate and replace key sub-assemblies in and around our Raft Isolation SystemTM. Simply put, should the user change equipment, TRIM allows for close-to-perfect reconfiguration, thus making our component-specific platforms future-proof. The audio enthusiast will continue to experience the highest isolation potential through any number of system iterations. SRA operates on the principle that anything less than component-specific gets you no better than close.